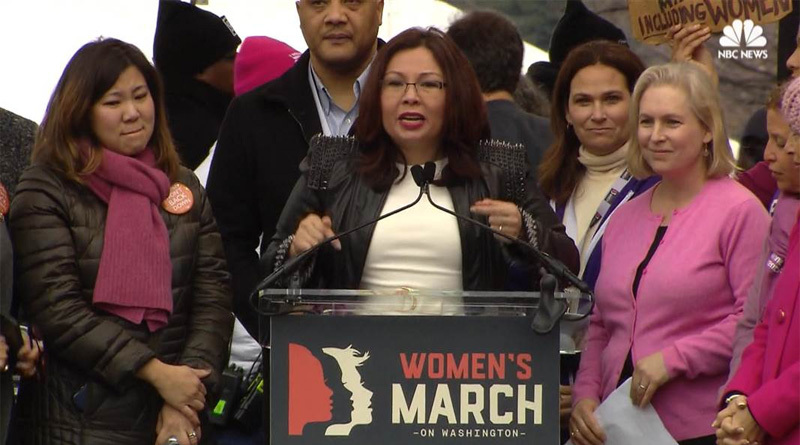 The Women’s March — which mobilized millions of women in rallies nationwide the day after Trump’s inauguration — has attracted substantial controversy for being exclusionary. In their earliest rallies, they specifically banned pro-life women from their march — and their founder, Linda Sarsour, has been accused of defending sharia law. Now, it looks like they’re continuing to divide Americans based on demographic—raising money for minority victims, while, apparently, being content to let white people drown. THESE DIZZY POSEURS ARE A LIVING, BREATHING EXAMPLE OF WHY THE FRAMERS OF THE CONSTITUTION DID NOT INCLUDE WOMEN’S SUFFRAGE IN THE ORIGINAL DOCUMENT. They didn’t allow any suffrage at all. It was only after the Civil War that men were allowed to vote.